With the 2. Bundesliga’s chase for promotion still tighter than ever, it’s make or break time for Hannover 96. A rather mediocre second half of the season has seen the Niedersachsen club’s push for an instant promotion back to the Bundesliga take a slight knock. Defeats to Greuther Fürth (an embarrassing 4-1 away defeat), and Karlsruhe (2-0, also away) will be seen as the catalysts for Stendel’s demise, but a 0-0 draw away at St. Pauli was the final nail in the coffin for the now former Hannover 96 coach. This was an experience I could not miss. A trip to the Millerntor-Stadion, home of St. Pauli, one of Germany’s most expressive and zealous fan groups. Famous for their socialist values and honest outlook on football, it’s a club that gets more attention for what happens off the field than what happens on it. Passing the regular security checks, I finally made my way into the ground. It didn’t take long for the atmosphere to engulf me. The away end was packed out, noisy, and ready for what was to be a tense game. With AC/DC’s ‘Hells Bells’ playing over the sound system, the two sides made their way out of the tunnel onto the pitch, kick-off was approaching. The first half contained little to talk about. Half-chances seemed to be the main story of the first forty-five minutes. The biggest opportunity came when Bernd Nehrig of St. Pauli flicked on a corner towards the far post, Philipp Ziereis then coming very close to turning it into the Hannover goal had it not been for a matter of inches. The ball went harmlessly wide of the far post. Waldemar Anton, playing at defensive midfield for this game, almost got himself on the scoresheet. Cutting in onto his left foot he unleashed a powerful effort that swerved wide of the mark. An even first half with no goals. St. Pauli definitely looked the stronger of the two sides after the break. Hannover were pushed back, and forced to defend for big periods. In the 57th Aziz Bouhaddouz very nearly put the home side a goal up. Entering the penalty and cutting in onto his right foot, he had, Tschauner, the former St. Pauli keeper, well beaten, unfortunately he didn’t beat the post. The ball bouncing off the woodwork and back into play before Hannover cleared their lines. Substitute, Lennart Thy was causing problems for the opposition defence. Having come close after his introduction, he then gave, Tschauner his toughest moment yet. Thy with a diving header after a delectable dink into his path from, Christopher Buchtmann, forced the Hannover keeper into a good save. It felt as if anyone was going to win this game, it was going to be St. Pauli. However, the last fifteen minutes was to be all Hannover. Noah Joel Sarenren Bazee would be the first of many to threaten the home side. He got in behind the defence and slotted the ball past the goalkeeper, but Ziereis was covering and ensured the ball didn’t go any further. A few moments later, Anton struck the post from outside the area. Hannover had turned up the heat. Then came the biggest chance of the game. Martin Harnik couldn’t have wished for a better opportunity. A flick on from Niclas Füllkrug after a long ball teed up Harnik to perfection, one on one with a great big goal ahead of him. But the striker couldn’t keep his composure and bottled the guests’ best chance of three points, ballooning his effort over the bar. Uffe Bech would be the last to try his luck in Hannover’s abundance of chances, but once again the ball couldn’t find its way into the back of the net. This time St. Pauli’s goalkeeper, Philipp Heerwagen denying the opponents. The referee brought the game to an end. Hannover unlucky not to come away with a win after what was a dominant last fifteen minutes, but it was too little too late. 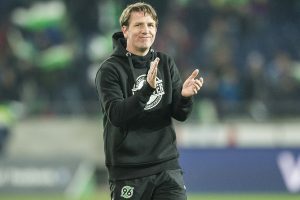 Daniel Stendel lost his job two days later and has been replaced by, André Breitenreiter, who took SC Paderborn to the Bundesliga a few years back.